While visiting our good friend Diana in Berkeley, she showed us this garden in her neighbourhood where huge sunflowers grow right at the side of the street. Out of all the pictures I took on this day, this one captures best the feeling of a hot summer day in the Bay Area. 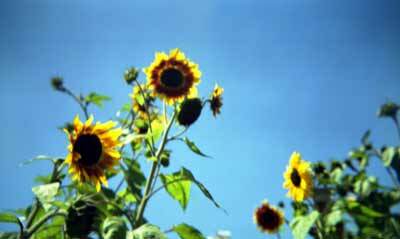 Taken on Agfa Optima 100 with one of my 50 year old Kodak Bull's Eye cameras with a close-up attachement. The wind was blowing the flowers out of the focus range, which actually turned out to make the picture so much better.